Northborough – Walking through Northborough just became a bit more interesting. As you are walking through town doing errands or taking a hike on one of the town’s many trails, keep your eyes open as you may discover a painted rock placed simply to make you smile. Northborough resident Rikki Bezzant started the Northborough Rocks! group over the summer and the fun and messages are spreading. If you find a rock you may keep it, re-hide it, or leave it for someone else to find. Bezzant encourages people to paint and hide their own rocks. The goal of the group is simply to spread joy, kindness and brighten someone’s day. Bezzant became aware of similar groups in other areas across the United States while on a family trip, and after investigating realized there was not a local group. She has created a Facebook page so people can give hints as to where they have hidden a rock or post a photo of one they have found. She encouraged people to use good judgement as to the placement of the rocks they leave. The rocks should be placed in plain sight as the point is for someone to find it. Bezzant reminded participants to ask permission before leaving a rock at a business. Messages and artwork should be all positive and inspiring. Bezzant suggested choosing flat and smooth rocks, which are easiest to paint, and using acrylic craft paint on the rocks as it holds up best in New England weather. Some people are also choosing to use a clear spray-on sealant. One elementary school is incorporating painted rocks into its art classes and the rocks will be placed in a special area at the school. The Kindness Club at the Robert E. Melican Middle School painted kindness rocks as part of its first meeting this year. “It’s exciting to see it catch on,” said Bezzant, the mother of three children who all enjoy the rock painting as well as the rock discovering. Although the trend has grown by word of mouth, there are printable labels available to download on the Facebook page that can be placed onto the rock to help identify the group and its purpose for those who may not be aware of it. 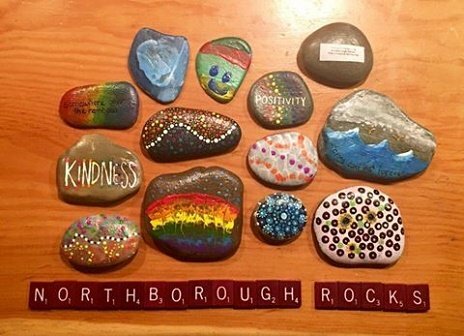 Visit “Northborough Rocks!” on Facebook for more information. Clark, 7, and Henry Bezzant, 5, are hard at work on their rock masterpieces. Painted rocks that have been placed around Northborough by Stefanie Konover.